All of the National Letters of Intent have been received and the Iowa Wrestling Recruiting Class of 2017 is in the books. This is an outstanding class. Recruiting is my passion so it does not get any better than this. Let’s take a look. “The recruiting shot heard around the wrestling world” was when Spencer Lee announced he was going to be an Iowa Hawkeye on April 20th. That may have been the biggest college wrestling recruiting announcement…ever. Lee has won three straight WORLD titles, and counting. I have been saying it for months now. Spencer Lee is the biggest recruit in Iowa Wrestling history, and will also be known as the greatest high school wrestler in the history of the United States. Spencer Lee is already a big influence for other recruits and I look for that trend to continue. No real way of describing just how big it is for Iowa Wrestling to get this guy in their program. Recruits at this weight are few and far between. Combine that with all that Warner has going for him and I believe he should be the number two overall recruit P4P (pound for pound) in the country for the Class of 2017 behind only fellow Iowa recruit Spencer Lee. Recently Warner placed third at the Cadet World Freestyle Championships. His only loss was on criteria in a tied match to the eventual champion. Warner has Hawkeye written all over him. His physical and aggressive style is just what we as Iowa Wrestling fans want to see. I described Warner as a Dr. Jekyll/Mr. Hyde recruit. A Dr. Jekyll top student and citizen off the mat, and a Mr. Hyde attacking tough guy champion on the mat. Warner already has Heavy Hands in his arsenal and is everything you want in an Iowa Wrestler. In my opinion, as far as being an immediate impact type of wrestler, Warner is right on par with Spencer Lee. Murin became the fourth wrestler from the Young Guns Wrestling Club to become a Hawkeye when he gave his verbal commitment on August 27th. The experience of training the Iowa-Style under former Iowa Hawkeye All-American Jody Strittmatter at the Young Guns Wrestling Club adds to the value of getting Murin in the program. Murin had a very impressive showing at Junior Nationals in Fargo where he placed third at 132 lbs. In his eight victories, Murin outscored the top competition in the country by a combined match score of 97-27. Murin is a self-described grinder that also puts up that kind of points. He is going to be a fan favorite. Costello turned heads by pinning his way to the finals at State for Western Dubuque last year in 3A. This past summer, he placed sixth in Greco-Roman and qualified for Junior Freestyle Nationals. I was impressed with Costello at the Night of Conflict at Carver where he defeated Sammy Evans of Tennessee, 5-3. Evans is ranked tenth in the country. Costello has an 87-15 career record at Western Dubuque with an impressive 51 pins and five Tech Falls. Iowa Wrestling has more to offer a Hwt wrestler for coaching and workout partners than any other program in the country. I look for Costello to develop in the Iowa Wrestling room and weight room into a solid college Hwt. Axmear placed 5th as freshman, 3rd as sophomore, and 4th as a junior in 1A in Iowa. Last season he was unbeaten and ranked #1 heading into state at 152. Axmear went 4-2 at Junior Nationals in Freestyle this summer at 152. All four of his wins were by Tech Fall. Axmear is a small town Iowa tough guy that you want in your program and on your side. Wilson was a Colorado State champion at 170 last season. He also wrestled a lot of Freestyle and Greco-Roman in the off season. Wilson competed in both Freestyle and GR at Junior Nationals this year where he scored an impressive 9-4 decision over Iowa State recruit Marcus Coleman in Freestyle. Wilson also had an impressive showing at the Super 32’s in October before he had to withdraw due to injury. The more I see of this guy, the more I like him. Could be a huge sleeper pick for this recruiting class. The Hawks also welcomed Dan Murphy of Colorado in last year’s recruiting class and Nathan Burak is also from Colorado. Colorado is a state definitely on the way up for wrestling and maybe there will me more recruits in the future. Stickley is a unique situation as he graduated from St. Paris Graham High School last spring where he was a two-time State Runner-Up in their legendary wrestling program. He is now living in Iowa and is not attending the University of Iowa. From my understanding, Stickley will enroll for classes next fall and be a member of the Iowa Wrestling team. Stickley had a very impressive tournament last weekend at Luther College in the Silver division where he won the title at 133. After a decision and Tech Fall, Stickley defeated future teammate Jack Wagoner of Iowa in the semifinals, 9-5. In the finals Stickley won by a 16-5 Major Decision. Stickley was a teammate and classmate of Alex Marinelli. Guessing Stickley’s eventual weight is just that, a guess. He is still growing. Iowa had received a verbal commit from Luke Troy of California. Troy is no longer coming to Iowa and I have not heard if he has signed at another college at this time. For Iowa Wrestling being able to go into the state of Pennsylvania and Illinois and get the top recruit speaks very well for Iowa Wrestling. The Young Guns tradition is really taking hold as former Iowa Hawkeye All-American Jody Strittmatter’s club is putting more and more wrestlers in the Black and Gold. I made the comment several times in previous blogs that champions want to be around other champions. 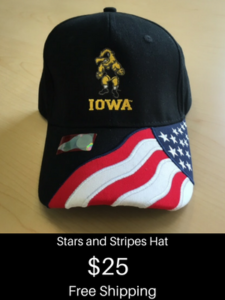 That tradition has started up a new breed of recruits for Iowa Wrestling. The Hawks already have Gavin Teasdale as a commit for the Class of 2018. Teasdale is also from the Young Guns Wrestling Club in the Pittsburg area. Between the Young Guns recruits from Penn State turf and now two recruits from St. Paris Graham in the heart of Ohio State Buckeye country, the Hawks have momentum going their way in recruiting. Look for more future recruits from Ohio and Pennsylvania making their way to Iowa City to wear the Black and Gold of the Iowa Hawkeyes. As I said, champions want to be around other champions. Iowa Wrestling is the place to be right now, and the recruits know it. 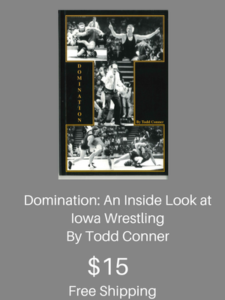 The benchmark for Iowa Wrestling recruiting classes for individual titles won is the Class of 1993. Mark Ironside (2), Jeff McGinness (2) and Joe Williams (3) won seven individual titles. Time will tell how many titles the Iowa Wrestling Recruiting Class of 2017 will win. You can bet that I will be there to see them through in college and International wrestling. It is not out of the question for Spencer Lee and Jacob Warner to make a huge run at the 2020 Olympic Freestyle Team. I really could care less how national publications rate this recruiting class. In my opinion and knowledge, Iowa Wrestling got who they wanted. If the Iowa Wrestling coaches got who they really wanted and are this excited about a recruiting class, that is all that I need to know. Iowa Wrestling fans, there is a lot to be excited about with this Iowa Wrestling Recruiting Class of 2017.